...or so you would think. Not long after I hired out, an entire train/engine crew - four guys - overlooked a flat meet at Alvarado (near Oakland) and wound up meeting a bewildered opposing train crew at Newark. Their next meet was with the trainmaster. Anyway, the example at left adds a minor wrinkle: on the Western Division, westbound extras hold the main when meeting east extras, but in this case, the Form S-A instructs the 3208 west to go into the hole in favor of the 2471 West. 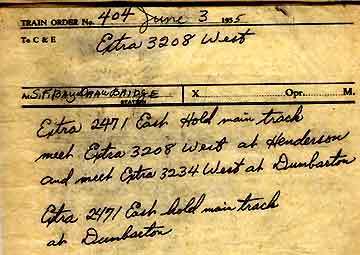 The order at left is interesting since, by the mid-1950's, handwritten train orders were not very common on SP. Likewise, the bridgetender/operators at the Dumbarton drawbridge cut very few train orders.